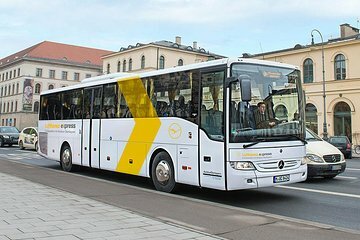 Bus was easy to find at Central Munich Station and drove to the airport efficiently and safely. Driver was helpful with luggage, knowledgeable, and friendly. Much cheaper than a cab or private car. Thank you! Should you book a room close to one of the shuttle pick up points this is a very inexpensive and convenient way to get to and from the Munich Airport. Our hotel was a block and 1/2 away so, even with luggage, connecting with the shuttle was an easy walk. Excelente servicio, muy puntual en la salida y sobre todo economico para el servicio dado. Gracias. Only thing I would change is to have an announcement at the terminal that explains which airlines are located at that terminal stop. We almost missed our terminal because we weren't sure. The bus driver was very nice though. Was easy to find and reliable with the transit. Shuttle bus goes regularly and is situated just outside of train station was access was easy. The driver was great and no hassles or delays getting there. This was much quicker than the train when I arrived, granted the shuttle was early morning and therefor no peak hour traffic. We recommend this service highly!!!! Timely and easy , especially if you have multiple bags. Drivers are professional and so helpful! The free wifi is nice bonus. Overall, host was more focused on family member accompanying her, vs providing guidance to meet all needs.